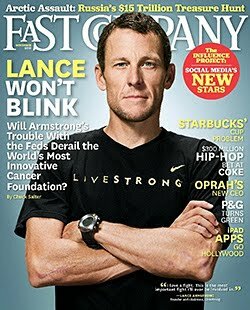 It is no lie to say that my photo is included in the latest issue of Fast Company magazine, the one with Lance Armstrong on the cover, on page 138, in a section about Social Media’s New Stars. Well, according to Fast Company, I’m one of them. That much is all true. Of course, the full story is that I’m one of 32,955 people who entered themselves in an “experiment” to determine who was the most influential person online, and I’m one of 29,795 people who also submitted a photo, and therefore were included in a four-page spread in the magazine. 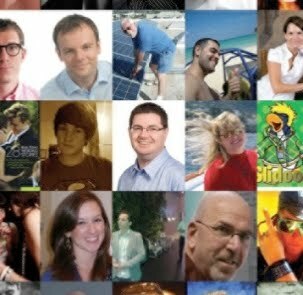 Those who, through a combination of clicks and signups, were deemed the most influential, have their photos a little bigger than those of us who are not in the upper echelons, but my photo does actually happen to be in the top third of all those on the page. If Shaquille O’Neal is No. 1,709 and I’m just one row below him, that’s gotta mean I’m up there — relatively speaking, of course. And if that’s not enough, the web site says I’m in the 94th percentile, so that’s definitely up there. I mean, the whole thing was nothing more than a virtual popularity contest, but still … it’s pretty cool, right? ← What Did You Think Was Going to Happen?